May 2017 • SMT Magazine 29 one in which the intern reaps all the benefits," begins Roller. 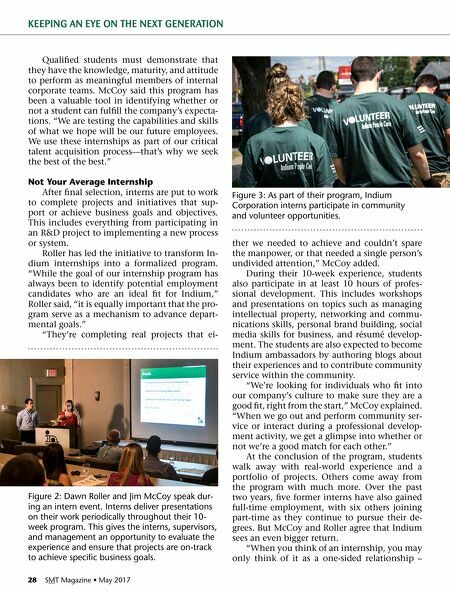 "But, what we have learned over several years of informal internships, and in just three years as a formal program, is that we gain a lot through these experiences." "This program keeps us on our toes," fin- ished McCoy. "As supervisors and mentors, we're required to evaluate ourselves. Are we be- ing good leaders? Do we need to refresh our communication skills? Should we go back and revisit the basics? What types of professional development courses do we want to seek?" Not Your Average Recruitment Strategy The internship program isn't the only tool in Indium's next generation recruitment strat- egy. We participated in more than 30 recruit- ment events in 2016. These included career and job fairs; presentations; workshops; and science, technology, engineering, and math (STEM) events. "It is incredibly important that we are active in the STEM community," McCoy said. "This is our best way to interact with the next genera- tion, as well as to get to understand what future employees expect from us as a company." Each year, local students and educators from grade school through college are encouraged to participate in facility tours and job shadowing. Several Indium employees even serve as stu- dent mentors, providing guidance on every- thing from college applications to potential ca- reer paths. We've also established connections with military veterans groups. The company has started to garner recogni- tion for our exceptional recruitment activities. In 2016, the New York Association of Training & Employment Professionals presented Indi- um with a Business Leadership Award for out- standing workforce development advocacy. In- dium also earned an Outstanding Business Part- ner Award for its exemplary dedication to the advancement of STEM students. Not Your Average Outcomes Some may be wondering why Indium in- vests so much time and effort into its early re- cruitment programs—especially those responsi- ble for budgeting. If so, you may also be ask- ing yourself, "Why dedicate hours to providing professional development to a group of tempo- rary student interns? Why open your doors to kids, some of whom haven't even entered high school?" "The short answer is, it makes us better," Roller said. Indium benefits from developing a bright and promising pipeline of future employees, creating lasting business and community part- nerships, and further developing current em- ployees' skills. 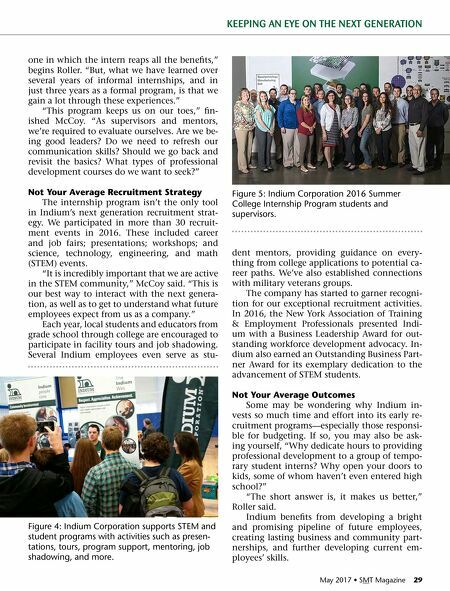 KEEPING AN EYE ON THE NEXT GENERATION Figure 4: Indium Corporation supports STEM and student programs with activities such as presen- tations, tours, program support, mentoring, job shadowing, and more. Figure 5: Indium Corporation 2016 Summer College Internship Program students and supervisors.